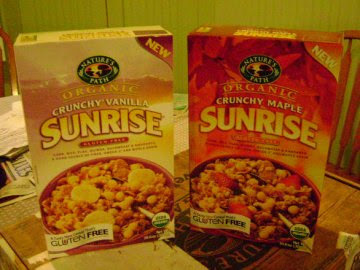 The Nature's Path Organic Foods company recently sent me two packages of their new Crunchy Maple Sunrise and Crunchy Vanilla Sunrise cereals to sample and I am delighted to report that both were excellent. My husband already enjoys their Peanut Butter Panda Puffs that we find in the gluten-free section of our local Hannaford Supermarket, and these two new GF cereal varieties are a welcome addition to the repertoire of breakfast foods he can safely enjoy. Both new cereals are delicately flavored with maple and vanilla and are truly crunchy, even after hanging out for a while in their milky bath, so that is also a positive factor in my mate's enjoyment of his morning meal. He abhors a soggy cereal and I like the whole grain additions of flax, amaranth, quinoa and buckwheat, as so many other breakfast options for the gluten-free diner are lacking in fiber. You can find out more about the Nature's Path line of organic foods, and their gluten-free foods, at their website. I just bookmarked their recipes tab too as they have a lot of great ideas for smashing up their GF cereals into yummy-sounding baked goods and side dishes. Despite my husband's funk as he watches his beloved Giants team falls further behind this football season, there must be a hallowed time for him each week to scream at the television set and revel in his sports lust. And there must be accompanying snacks. Before the gluten-free lifestyle entered our household, the snack fuel for these weekly testosterone-laden sessions primarily consisted of beer and pizza. Now that barley malt and wheat crusts are verboten for my hubby, I try to make sure we have Redbridge Beer (made from sorghum, reminiscent of Killian's Irish Red Ale) around and some tasty dips and spreads for his tortilla chips and vegetable sticks. 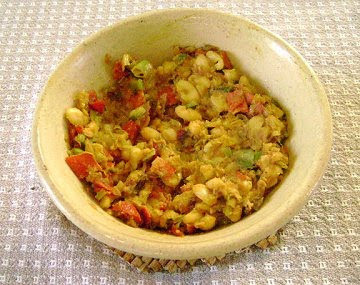 I was planning to make some guacamole for his last viewing session, but my avocado was too far gone, so I rummaged around the cupboards for inspiration and decided to make a spicy bean dip for him. It was a hit with the old man, so I made sure to write down what I slapped together to share with you all. Melt butter in frying pan and heat garam masala 1-2 minutes, or until fragrant. Add garlic, chives and red pepper, and cook, stirring, another several minutes, until red pepper is softened. Add beans, and mash them up a bit, stirring and cooking another several minutes to heat through. Add mango chutney and season with salt and pepper. Makes 2 cups. Great served warm with tortilla chips. The October cookbook offered up by the Crispy Cook was a vintage copy of Caroline Hightower's "The Pennypincher's Book of Fine Food". Martha my trusty scullery hound helped me to randomly select the winner of this prize (along with random.org), commenter #7, Cee. Congratulations Cee! 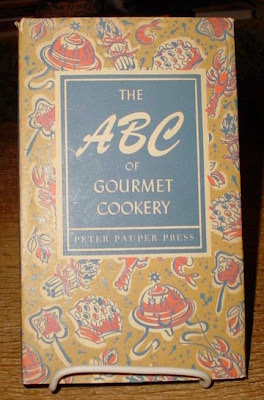 For this month's cookbook giveaway, I straightened up the ol' cookbook section at Old Saratoga Books, the used and rare bookshop that my husband and I own, and found this cute book: "The ABC of Gourmet Cookery" published in 1956 by the The Peter Pauper Press. This publisher specializes in diminutive gift books and the vintage editions of their titles have become collectible for their whimsical, beautiful and distinctive illustrations. "The ABC of Gourmet Cookery", illustrated by Ruth McCrea in vivid 50s style, contains recipes for each letter of the alphabet. From Arroz con Pollo to Hungarian Tomato Sauerkraut to Zabaglione, it's a visual treat. To enter the giveaway just leave a comment below by midnight (Eastern Standard Time), November 30, 2009. I will randomly pick a winner from the comments below and ship the book anywhere in the world to the winner. Good luck to all Gourmets!